Butterfly cupcakes, hydrangea cupcakes, rose cupcake and rose petal cupcake. 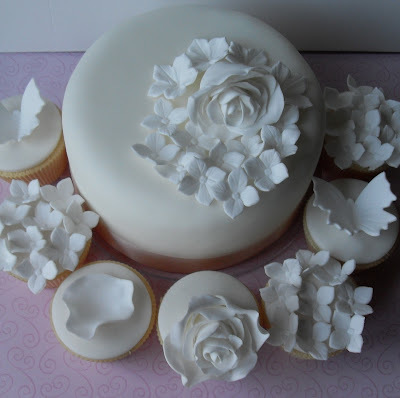 Cake with white rose and white hydrangea flowers. This is so stunning. I never realized how appealing the starkness of using just white on a cake could be. The pink ribbon is such a nice touch. Unique and creative-well done. Oh wow, stunning. I wish I had your skills with baking. Wow! Such a stunning wedding cake and cupcakes. it's simplicity makes it more beautiful and elegant. Thumbs up for sharing this to us.